Several collectors have sent reports of oddities from several different Post and Go machines: I've been waiting for an opportunity to tell you about these, and now that there are several to report, it seems an appropriate time. 1. At Yeovil machine 68 is printing significantly (9 mm) to the right. These were produced on 15 January. The Winter Greenery stamps have now been replaced by 2nd class Machins (MA13), but the fault continues. I've been reminded by DP that a similar error was shown last July. Then the error was at Lavender Hill in Battersea , in May: also on 68. It also happened on machine 68 at Earl's Court . So, is there a problem with machines number 68? Other reports are most welcome! "At Tudor Street yesterday both the machines that were working only vended 5 values (no Euro20g/World 10g), but charged for 6, just as the NCR machines did last year with the introduction of the 60g values. Strangely, the machine was able to vend the euro20g/World 10g on its own or with other values but not as part of the pre-programed collectors set option, images attached. According to the manager at Farringdon Road, the software was updated a couple of months ago, and you only pay for the 5 values, the receipt does not support that view"
Surprisingly, one of the machines is still dispensing Robins [MA13]. As you can see (click on the image for a larger version) there is a 'nick' at the foot of the Europe 60g stamp: this is normally associated with the end of a strip of 5or one of the two strips of 3 - these are Wincor-Nixdorf machines. "DP also has the set from Southport with the same problem (vended 29/1/15), bought from eBay. 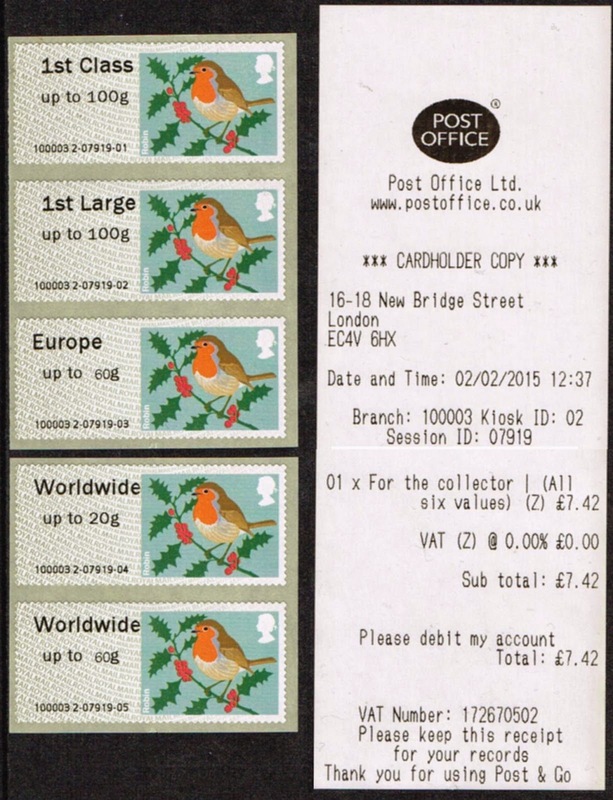 The same seller also has examples from Keighley (vended 28/1/15) with the original Europe 20g value. Keighley’s machine seems to have been reset late November; on 29/11/14 it was on session 00436 with the original Europe up to 20g according to an ebay seller's photo. 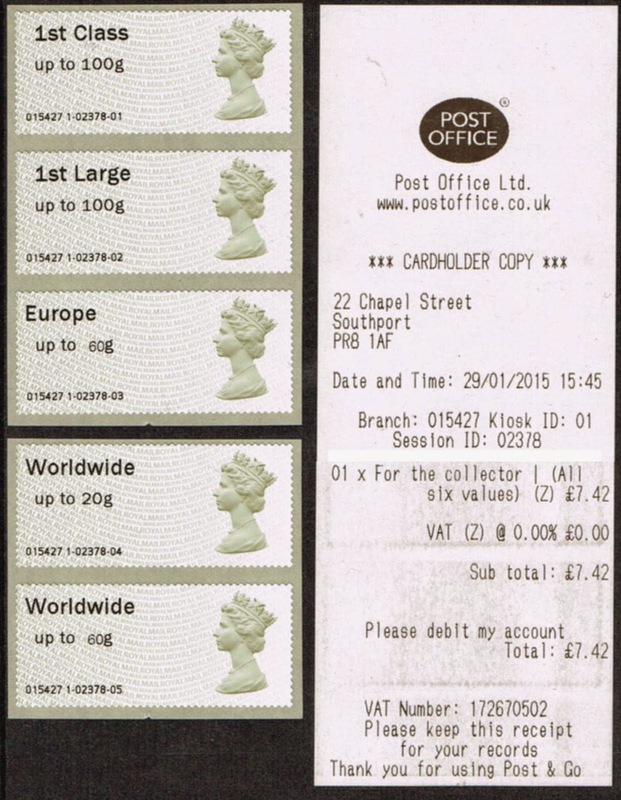 On 20 October 2014 it was on 04586 vending the dual value stamp." As DP writes, the last few months of the Wincor-Nixdorf machines will not be as simple as we may have hoped! 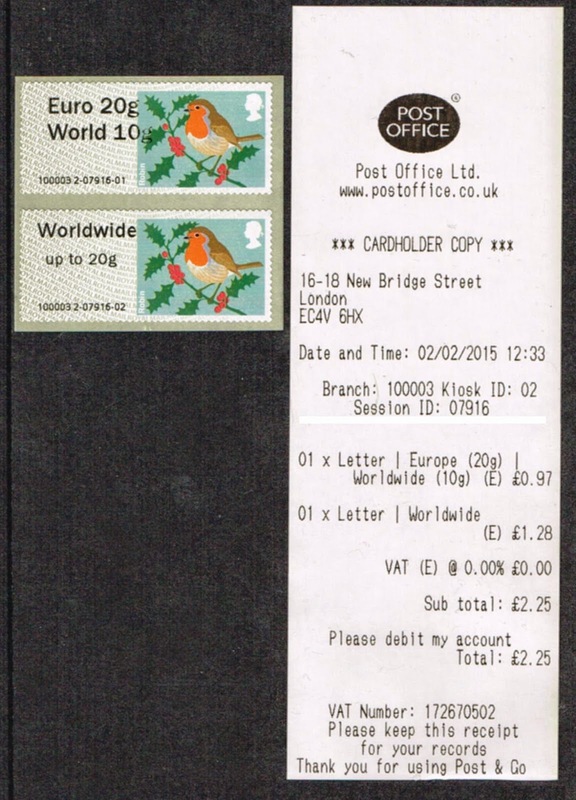 The Wincor machine at Farringdon Road PO (100003) was out of order on the 9/02/15 as was machines 3 & 4 at Tudor Street. Machine number 2 at Tudor Street was vending Pigs and still without the dual value stamp.